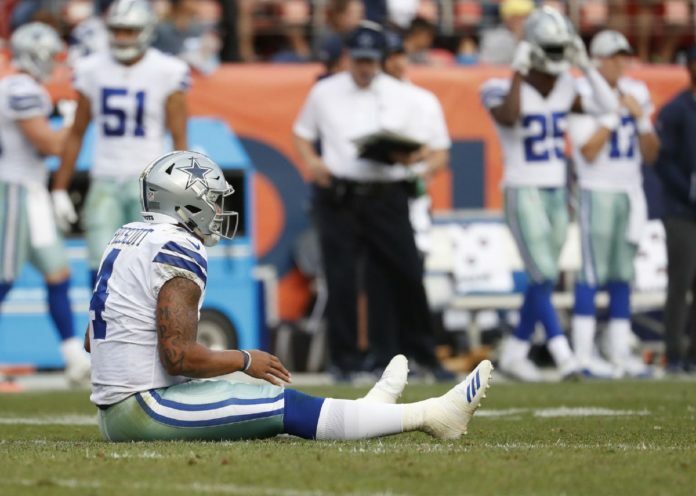 After an exhilarating victory over the New York Giants, the Dallas Cowboys went into their first away game against the Denver Broncos with high expectations. Quarterback Dak Prescott was the 2016 Rookie of the Year, and running back Ezekiel Elliot was last season’s NFL rushing leader. Some said the team had the best offensive line in the league. In a stark contrast to their first game, the Cowboys lost 42-17 and had inferior stats in almost every category. The 25-point defeat was met with harsh responses from the team and its fans. Elliot, whose much-anticipated return seemed to be satisfactory against the Giants, rushed the ball for a career-low of 8 yards on nine carries. Prescott’s first two pass attempts helped him become the quarterback with the fewest interceptions (four) in his first 500 passes. But he ended up throwing two interceptions after setting that record, one of which led to the can’t-miss play of the game, in which Broncos cornerback Aqib Talib caught the ball in his own end zone and ran 103 yards for a touchdown. Prescott did, however, complete 30 out of a career-high 50 pass attempts, resulting in 238 yards and two touchdowns. But it was not enough to catch up. He said there was “no excuse” for his performance. Despite his disappointment, he commended the Broncos for their solid defense. Head coach Jason Garrett agreed that Denver pushed the Cowboys’ limits, and like Prescott, he owned up to their shortcomings. While not all teams are structured like the Broncos, upcoming opponents like the Arizona Cardinals and the Los Angeles Rams now have a basic blueprint to use against Dallas. The Broncos are only one of many teams the Cowboys will face in the coming months, but they gave a preview of the challenge that lies ahead.